Things have changed significantly in Shania Twain’s life between 2002’s Up! and 2017’s Now. The abridged version: motherhood, infidelity, divorce, remarriage, and paralyzing vocal issues. Despite the odds, Shania Twain remains resilient. 2017’s Now failed to ignite the same spark as previous albums, but that’s not hindering her. And while her vocal issues slow her down and require extensive workouts prior to performance, she soldiers on. The Barclays Center in Brooklyn was not sold out (tickets were available on resale for as low as $6), but that’s their loss. Shania Twain’s Now Tour was a stellar show with jaw-dropping production value. First of all, Shania sounded great. While there was surely some backing vocal assistance, Shania was still singing live and giving it her all. She opened the show by unconventionally entering the arena not on a stage, but between sections 9 and 8 (donning a cowboy hat, of course). Shania walking right through the crowd, down the steps to the floor, and over to the stage, much to the audience’s delight. 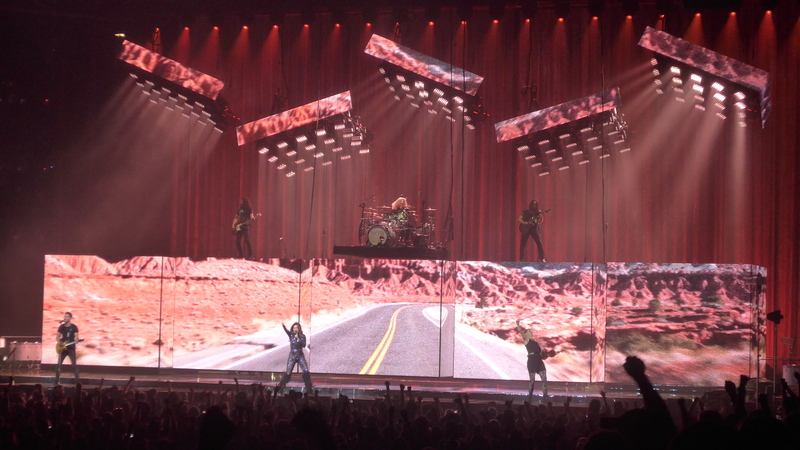 Visually Shania and the tour’s production were both top notch. Shania embraced her ‘diva’ side when it came to wardrobe, and looked great doing so. She cycled through no less than 5 outfits during the show, each tailored to fit the songs she performed in them. Most notable was the flow-y, leopard printed look sported during “That Don’t Impress Me Much”. There were also high-heeled boots and a cowboy hat or two, for good measure. Musically, Shania mixed in hits from The Woman In Me, Come On Over, and Up! with new songs from 2017’s Now. The music from Now transitioned very, very well to an arena, especially show opener “Life’s About To Get Good”, and “Swingin’ With My Eyes Closed”. While Now felt different than older material when it released in 2017, the music was nothing but copacetic throughout the show. Unsurprisingly, the reaction to the new music paled in comparison to the big hits. The excitement to hear Shania Twain sing the hits was heightened by the tour’s production value. The staging visually and literally elevated the classics. For instance, she went full on Tron (lasers and all) during “I’m Gonna Getcha Good”. The stage even brought her nearly to the ceiling during “Up!” At other moments, the 5 LED boxes, which rose, fell, and re-arranged, aligned to create scenes ranging from the interior of a bar to the open road to faraway paradises. As has become quasi-tradition with Shania performances, she took to the sky mid-show. She began her flight during the military salute “Soldier” from now. While she’s flown around on a horse before, this time she sat perched on a re-configured guitar case, covered with state stickers. After landing on the B-stage to get her guitar, Shania ascended again. She reminisced about the diverse ages of her fans, and how long she’s been singing some of her songs. Of course, this was all lead in to a required sing a long of her staple, “You’re Still The One”. She asked for phone lights as she sang, and the room illuminated. It was truly a highlight for the evening. Shania Twain has come a long way in her career. While she may not be Up! where she was in 2002, she’s not one to be counted out either. Based on the stamina she showed at Saturday night’s show at the Barclays Center, she’s just getting started again. With strong vocals, diva ensembles, and a dazzling production, the Now Tour is not to be missed. (If You’re Not in It for Love) I’m Outta Here!